Gurren Lagann takes place in a fictional future where Earth is ruled by the Spiral King, Lordgenome, who forces mankind to live in isolated subterranean villages. These villages have no contact with the surface world or other villages, and are under constant threat of earthquakes. Select villagers called diggers are conscripted to expand their homes deeper underground. Simon, a meek young digger ostracized by his peers, finds solace in his best friend and older brother figure, an eccentric delinquent named Kamina. Kamina allows Simon to join his gang, Team Gurren, to help him achieve his dream of visiting the surface world. One day, Simon unearths a drill-shaped key called a Core Drill, followed by a small mecha resembling a face called a Gunmen. Shortly thereafter, a giant Gunmen crashes through the ceiling and begins attacking the village, followed by a girl named Yoko who attempts to repel the Gunmen. Simon uses his Core Drill to activate the smaller Gunmen, which Kamina names Lagann and is used to destroy the larger Gunmen and break through to the surface world. 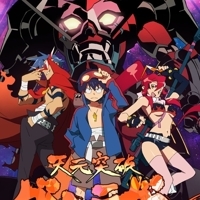 6791 users rated Gurren Lagann [TV].